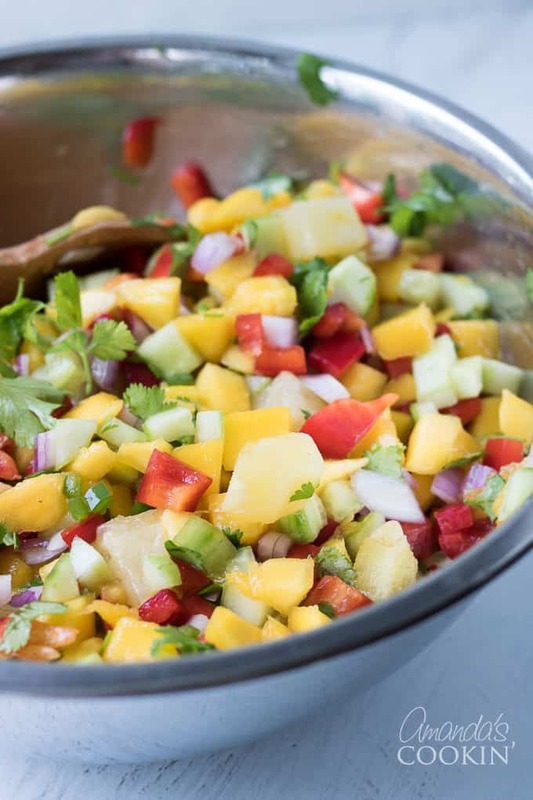 Mango Salsa: fresh mango, pineapple, cucumber and more! I attended a party at a friend’s house recently and was asked to bring my restaurant style salsa. 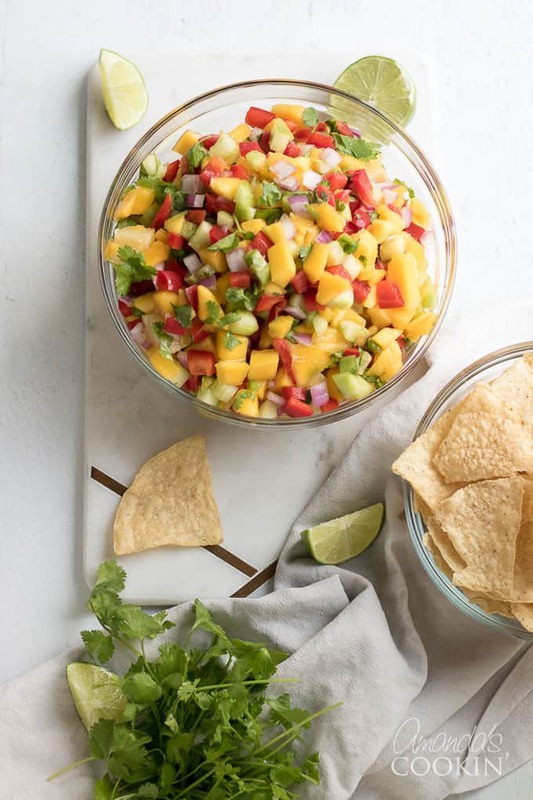 I went a bit crazy actually and brought that as well as my chunky salsa, a guacamole and this mango salsa I’m about to show you how to make. The star of the party? 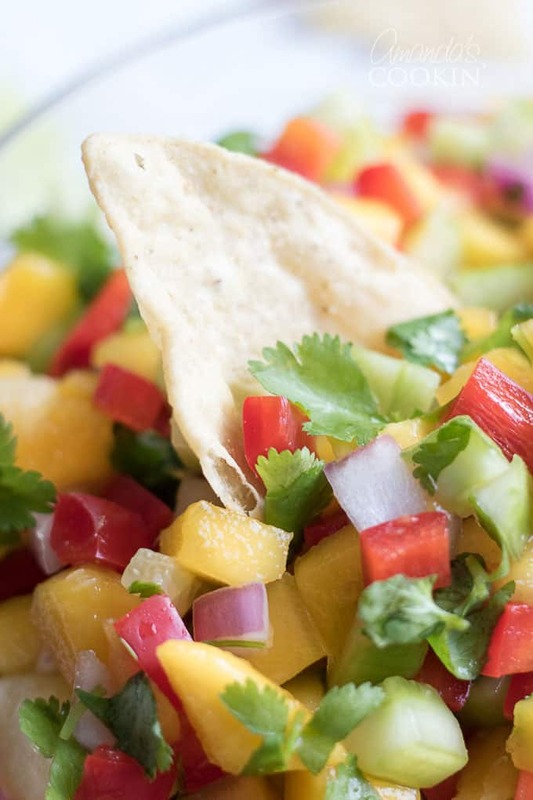 Mango salsa, hands down! 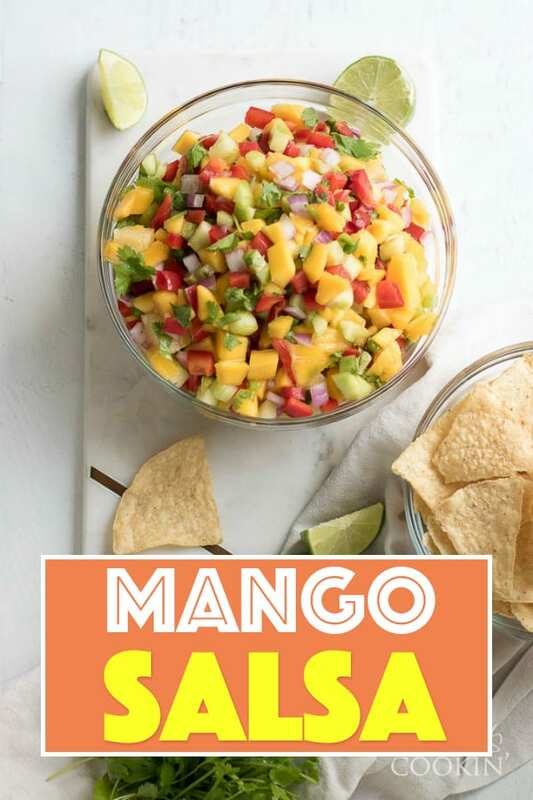 The day of the party, everyone one was raving about this mango salsa that I threw together based off of what I had in my kitchen. That was pretty astonishing considering it was not at all mango season. I made this for a New Year’s Eve party! 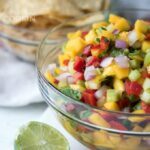 Now that barbecue season is upon us, I thought it was high time I added my mango salsa and this strawberry salsa to this blog. Choosing ripe mangos can be tricky unless you know what to look for. The color of the mango’s skin is not an indicator of ripeness, but rather the variety of the fruit. According to the National Mango Board, a ripe mango will give slightly when you squeeze it, similar to a peach or avocado. Another way to gauge ripeness is to smell the stem end. A ripe mango will smell like, well, a mango! This video from the National Mango Board shows how to pick a ripe mango. Mangoes are delicious, but they can be frustrating to cut if you don’t know how to do it. I’m including a video below of four different ways to cut a mango. I would recommend the first method for salsa, but the fourth method is fun and makes for a pretty presentation. I also use pineapple in this salsa recipe. You can use canned pineapple, but I recommend fresh pineapple as it has a firmer texture that will hold up better in the salsa. You can usually buy cored, fresh pineapple in the produce department of your local grocer, or you can buy an entire pineapple and use the extra for another pineapple recipe. The other fresh ingredients I use are cucumber (English cucumber works as well), red bell pepper and red onion. I wouldn’t recommend using green bell pepper in this recipe simply because it’s not as mellow as red, but yellow or orange bell pepper have milder flavors and will work well. Plus the red, yellow or orange bellow pepper add gorgeous color to this salsa! It’s best to use red onion, as yellow and white onion can be too harsh. However, Vidalia sweet onions would be an acceptable substitute. Don’t be afraid of the jalapeno! 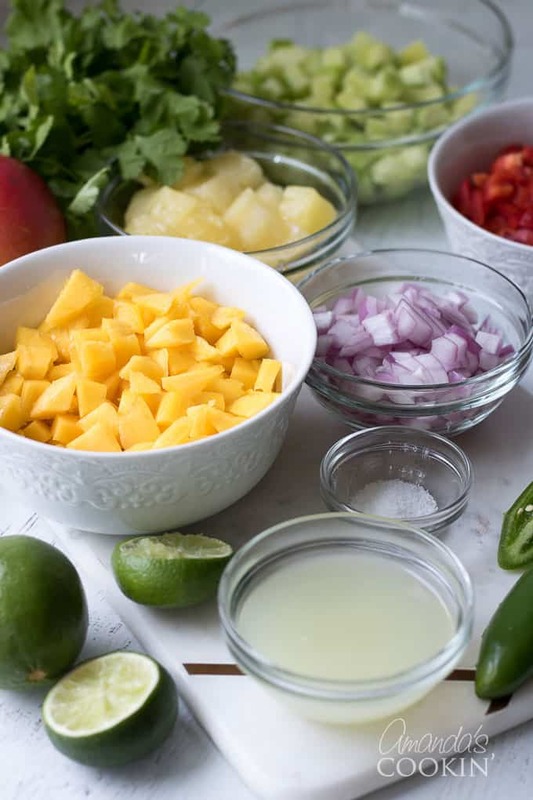 As long as you remove the white pith and the seeds, fresh jalapeno is not super hot and adds a nice little bite to this mango salsa. I use lime in this recipe and it’s what I recommend. 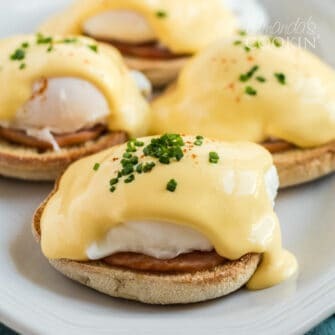 Lemon can be substituted but will give it a different flavor, try to go with lime. For those wondering, you can use bottled lime juice, I prefer freshly squeezed. Finally, don’t skip the fresh cilantro! Fresh cilantro has such a distinct flavor, it really kicks this salsa up a notch. I am not much of a gadget person, but there’s one “gadget” that I absolutely love and use all the time. It’s my Vidalia Chop Wizard and it’s ideal for chopping ingredients for salsa! I even bought one for my daughter for Christmas and she uses hers all the time too! I also think every kitchen should have a really big mixing bowl. When mixing up salsa for a crowd, you need something big enough to allow you to mix and turn your ingredients and get everything incorporated. A good knife is a cook’s best friend. Trying to slice a tomato with a dull knife is fruitless. It’s certainly not a deal breaker, but having a pretty serving set for your chips and salsa is great for potlucks, parties, barbecues as well as baby and bridal showers. 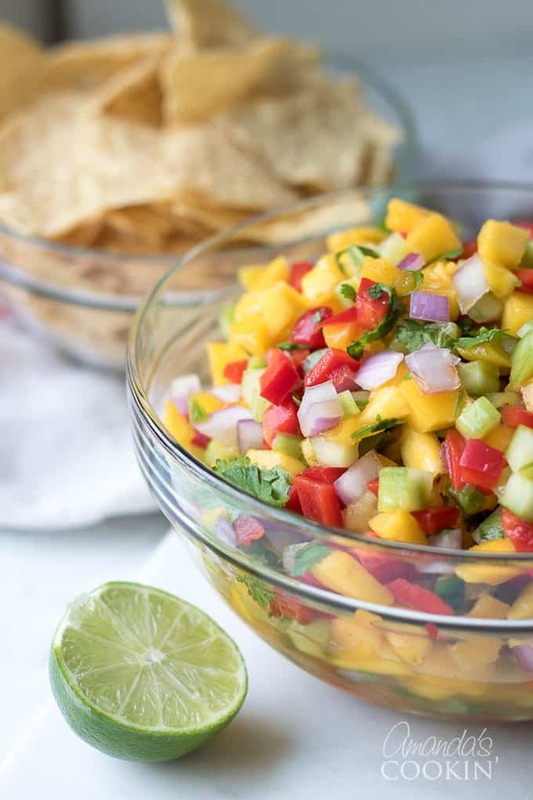 This mango salsa is absolutely delicious. My friend Cathy texted me on New Year’s Day and said she couldn’t find the recipe on my blog. She insisted I send it to her and proceeded to make it 4 times over the next couple of months. She told me they couldn’t get enough of it and it was their new favorite snack! I hope you get a chance to try it too. If you are a salsa fan you’ll definitely want to check out this pineapple salsa as well as this amazing cranberry salsa. I can’t close this post without telling you about these super yummy loaded nachos as well. Hope you have a great week! Switch it up and bring a Bruschetta for your guests! Because who doesn’t love a salsa-like concoction atop a piece of warm sliced bread? It’s truly addicting. Another great BBQ dip is Cowboy Caviar. Your guests will thank you. 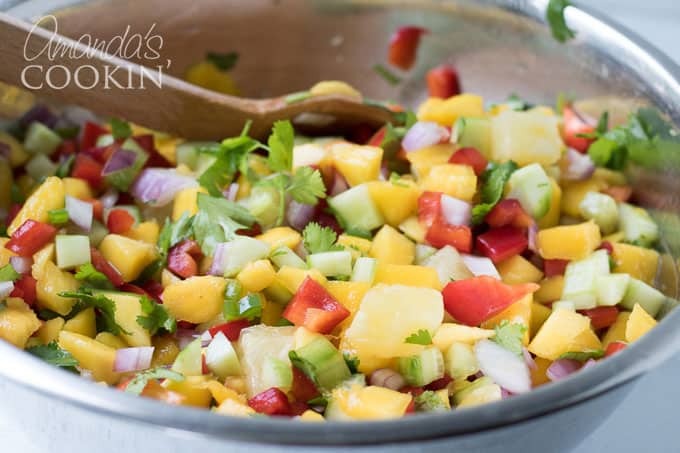 This mango salsa is full of fresh veggies and sweet fruit! Perfect for a potluck or barbecue. 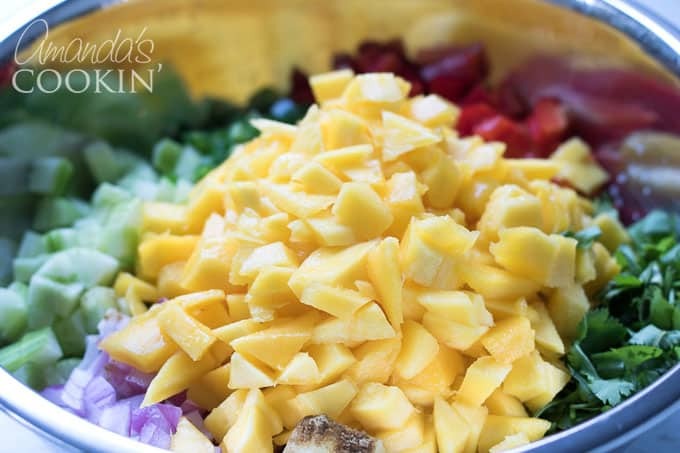 Simply combine ingredients in a large bowl, stirring and turning to combine.